The development of a neighborhood is the result of multiple and sometimes opposing goals of various interest groups. For one the demographic and development of the city should fit into a criterion demanded by the demographic living there. There are various aspects to the needs of these interest groups such as issues of life style: some people prefer that the neighborhood as is, quiet and almost like a village while others want it to develop and become more modernized and urban. Other aspect is the level of investment and creating an environment that people can have the potential to strive in, experience and gain a certain value out of living in said neighborhood. The U.S Department of Housing and Urban Development (HUD) addresses this as investable assets which is a more appropriate term than economy in a neighborhood. But with all the changes that can be made, there are other parts in a neighborhood that might not warrant change by a certain community. Great examples of this can be famous landmarks such as a church, statue or something iconic in that neighborhood. Warranting a change therefore should require a developer to have a certain level of knowledge and education of the neighborhood they want to develop. This made us question the path the residents of the neighborhood, Vinegar Hill want moving forward. As a result we came across interesting information from the 23 people interviewed in the area of Vinegar Hill. 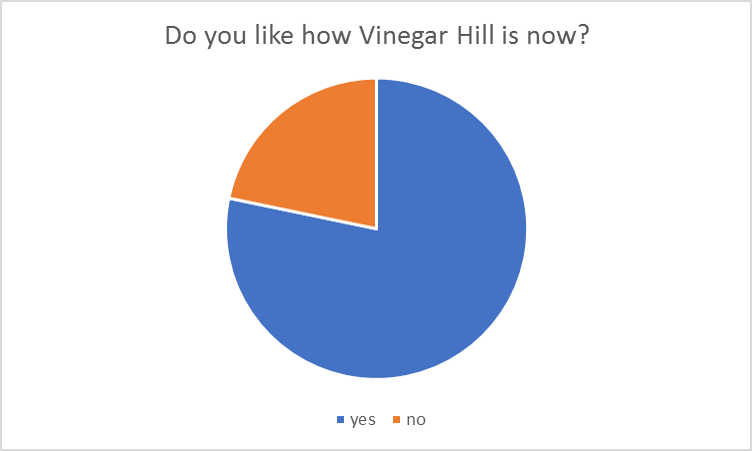 The survey included a variety of people with different relationship with Vinegar Hill. This included tourists, business owners, worker and residents. 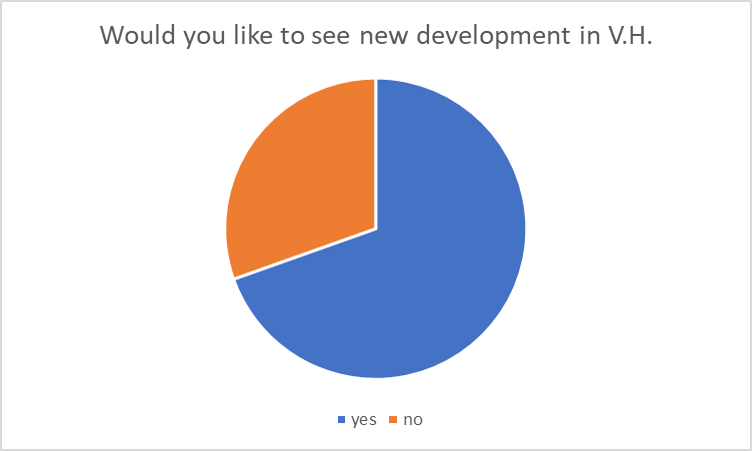 Throughout the survey we asked a series of questions that would paint a much more clearer picture of just what the people of Vinegar Hill want. 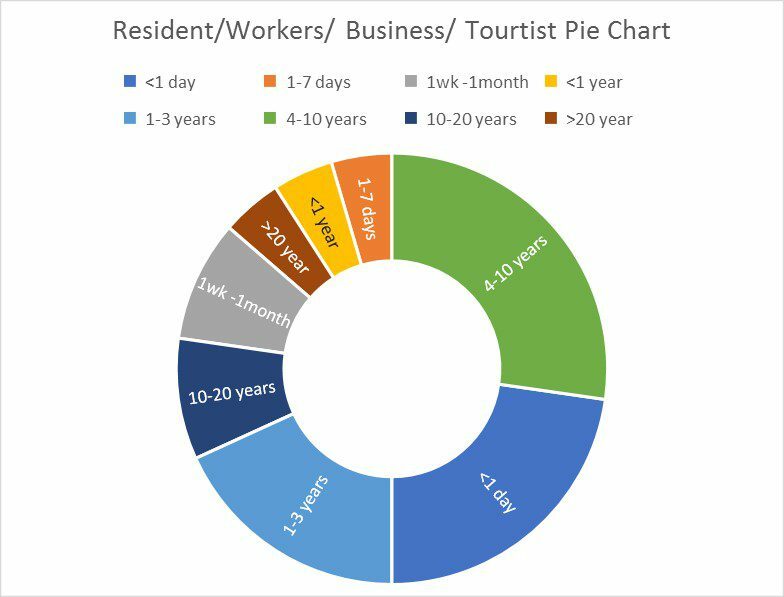 Biggest piece in this chart is the 4-10 years category followed by the 1-3 years, (excluding <1 day which is all tourists). Residents of the neighborhood seem to spend numerous amount of years and possibly decades thus possibly resulting in little change. 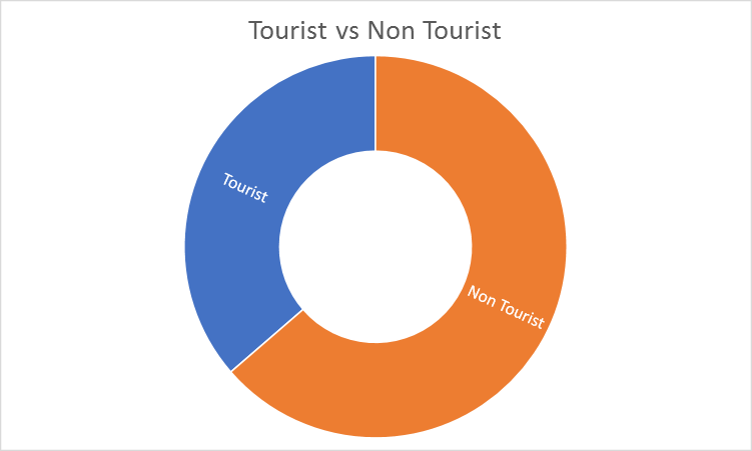 Anything under 1 year is 100% made of tourist. Tourists don’t come to Vinegar Hill because of the neighborhood or it very little attractions, the come to visit friends and family. Does this mean Vinegar Hill needs more landmarks(attraction), businesses to bring in more people like Dumbo? Do the resident of the neighborhood want more people? 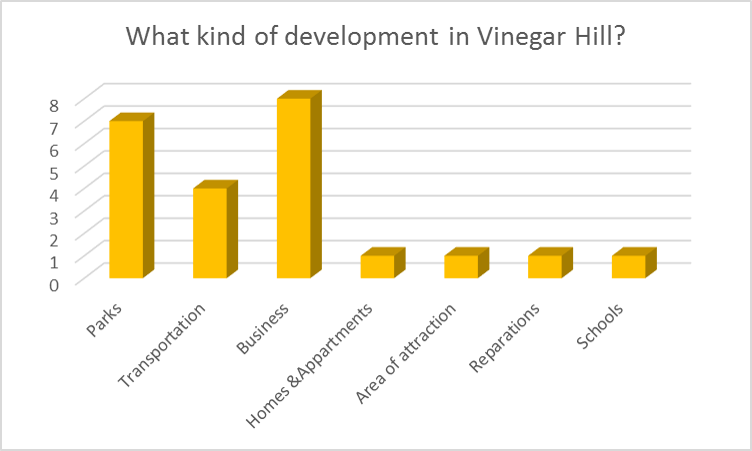 Majority of the people (more than 75%) made clear that they enjoy the way Vinegar Hill current attributes. 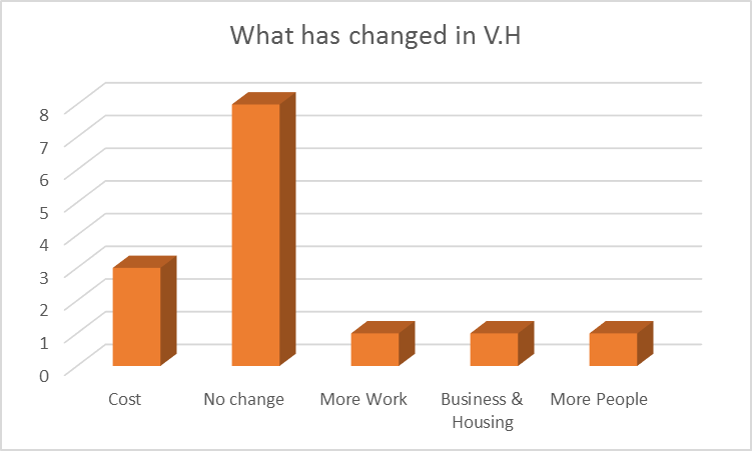 Graph that supports the previous graph by stating the changes Vinegar Hill has or hasn’t had. Second in the graph was the cost which is a normal behavior with inflation as the years progress. People were free to make any kind of development suggestion (not limited to one). Note how low area of attraction is. 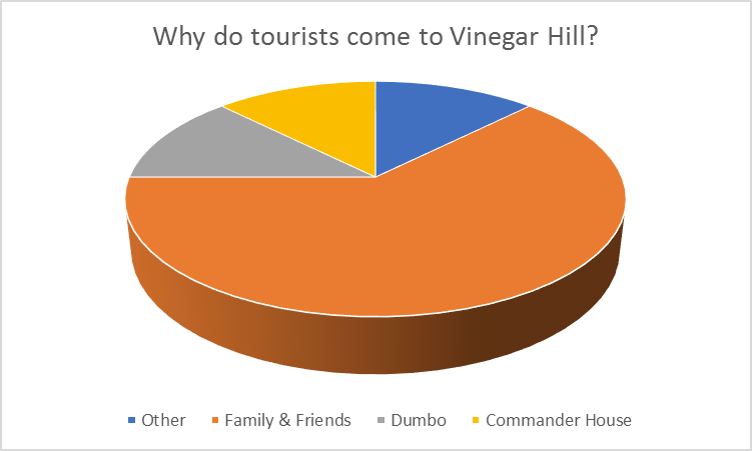 Does this mean that the residence of Vinegar Hill doesn’t really want tourists to visit? Note how low the homes & apartments and reparations categories rank. Based on this do the residence not want anyone meddling with their property? Transportation makes sense with the lack of trains and buses in the area. Lack of business as well makes it tough for residents and tourists to experience the neighborhood. Based on the survey the overall picture that is painted is that the residence of Vinegar Hill don’t want drastic changes. This kinds of changes includes the possibility of changing the zoning. This was in fact a recent event in the neighborhood where community members rejected a 9 story rental building. Reasoning for this was that the residents feared that it would overburden the neighborhoods infrastructure because it would be twice the height in comparison to nearby building. In addition the residents feared that this would allow developers to continue more projects changing Vinegar Hill unique identity completely. Thus numerous signs points toward the residence fighting towards keeping the place they call home intact. The territorial level is so great that they don’t seem to be bothered by the prospect of not receiving many outside visitors (based on the survey). Thus Vinegar Hill will continue to be in a tug war between residents and developers until either interest groups can come to an agreement..